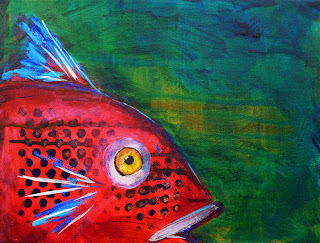 This red rock fish emerged from my canvas late one evening as I was spattering paint. It began with a big swath of color; some yellow, some blue, some red. The paint dried and I stared at it for a long time. I rotated the canvas and stared some more. The yellow and blue and pooled together creating a deep, rich green, but the red just stood alone and grumbled. The next morning the faint outline of a fish began to talk to me. It said, "Give me an eye." With a little help from my brush and some yellow paint, an eye appeared. Then the spots, then the fins. Eventually the fish said, "Thank you," and I put my brush down. Visit here to learn more about this abstract fish painting. Summer is quickly passing. I hope everyone is enjoying the season, relaxing, and recharging their batteries. I've been doing some of that myself. In spite of the title, this painting is one that created a lot of pleasure as I painted it. 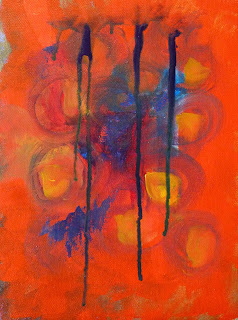 Splashes, swirls, and lots of color were fun and allowed my creativity to exert itself. The original painting is 9x12 inches, but can also be purchased in larger sizes in the form of a canvas print, framed print, art print, acrylic print, or metal print. The most exciting part for me is that I can also offer this painting in the form of an iphone case. It makes a really cool iphone case. Click here to view purchase options. Hope you continue to enjoy your summer and take some time to relax.